If you are looking for a hotel with Spa Taormina is ready to welcome you at the La Plage Resort, located right on the beach and featuring a modern and stylish Spa: a hotel Taormina that will give you a new balance for your daily life. The ExPure is the Spa of our hotel that will turn Taormina in the starting point for a new life: leaving behind all the stresses and concerns of the tiring working weeks you will regain the correct psychophisical attitude and you will enjoy a relaxing and amusing holiday. 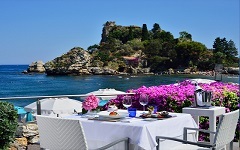 Overlooking the bay of Isola Bella and immersed in a true natural paradise, the oasis of beauty of the ExPure SPA of our hotel in Taormina it's an exclusive ambience where our guests can rebalance their own physical and mental well-being. Surrounded by an atmosphere of fresh fragrances and relaxing sounds, you will be bound to forget the fast-pace of the city, the stress or the fatigue of your journey. Let us take care of you and all your senses will be ravished by the style and the functionality of our Spa.